I was hugely excited to get this because,  I know Rosemary Tuck's art from other recordings, and  Richard Bonynge, as is well known, is a bel canto specialist. The English Chamber Orchestra, too, is highly regarded. I've been very happy to see Bonynge enter into this type of repertoire. This is an highly entertaining disc. I was disappointed in the sound somewhat, except for the last piece listed above, which sounds richer and fuller. 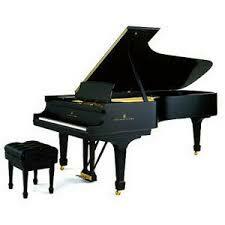 The Steinway piano I would have thought to be more forward in its sound, though it sounds as though the soft pedal is depressed most of the time and the balance between piano and orchestra is perhaps a bit more "hallish" than one might want thus losing clarity to some degree. Rosemary Tuck is a superb pianist and seems very much in her element here. Nevertheless, these are world premiere recordings. 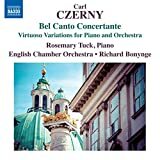 Anyone who thinks Czerny only wrote piano excercises will do well to look into this disc and many other works that are finding their way to discs. Very curious to know ... how many here would buy this issue? It's Naxos, and therefore presumably $10 or so. I'd snap it up in a heartbeat if I came across it. But I won't order it online. And, as I don't go into record shops (as an alcoholic avoids bars), I may miss out. AhA! You caught me out!